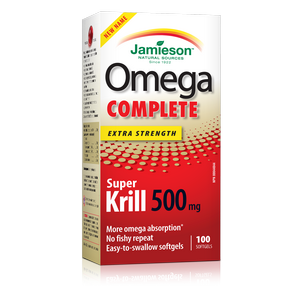 Omega COMPLETE™ Super Krill 5000 mg is made of 100% pure Antarctic krill to help support heart health and reduce pain associated with osteoarthritis. These easy-to-swallow softgels are highly absorbable with no fishy repeat. Non-medicinal ingredients: Gelatin, glycerin, sorbitol. Hypersensitivity (e.g. allergy) has been known to occur with shellfish; if this occurs, discontinue use. Adults and adolescents 9 years and older: Take 1-2 softgel daily. Store between 15ºC and 25ºC, away from children.